You are here: Home / News / The far reaching impact of the NCAA basketball corruption scandal. The far reaching impact of the NCAA basketball corruption scandal. (ThyBlackMan.com) As the month of March dawns near, most of the attention in sports turns toward “March Madness” and the men’s and women’s college basketball tournaments. However, men’s college basketball finds itself in a white, hot spotlight after extensive reports from Yahoo! Sports revealed an FBI probe into some of the top players and top schools in college basketball. The schools and players named are significant and are known beyond college basketball fans and could have implications about how the NCAA is structured, the NBA’s age limit restrictions, and the long-standing debates about whether NCAA athletes should be financially compensated with money adequately. The numerous NCAA rules that are in place that limit what college basketball players and college football players are permitted to do under the idea of “amateurism”. The Yahoo! Sports report uncovered some mass corruption and bribery involving some of the college basketball’s top programs. Top college basketball programs like Duke, Kentucky, Texas, and Michigan State might be guilty of potential impermissible benefits and preferential treatment for players and families for various amounts and reasons. High profile basketball players like Markelle Fultz, the first overall pick of the 2017 NBA Draft, and former NC State freshman Dennis Smith Jr., both received five-figure payments prior to their one year stints at their respective schools. Current college basketball players like Michigan State’s Miles Bridges and Kentucky’s Kevin Knox allegedly benefited by family members taking money or taking money themselves. One of the biggest developments of the college basketball scandal is that FBI wiretaps intercepted multiple conversations between Arizona head coach Sean Miller and sports agent Christian Dawkins in which Miller discussed a $100,000 payment to ensure star freshman Deandre Ayton signed with the Wildcats. If the NCAA discovers that Miller did so, it will deal a very tough amount of penalties to both Miller and Arizona. One of the interesting links regarding the players involved in these allegations are that many left college after their freshmen years to enter the NBA, making them “one-and-done” players. Most of those players were extremely highly rated high school basketball recruits who likely never enter college had they had the opportunities of guys like Kevin Garnett, Tracy McGrady, and LeBron James to enter the NBA following graduation from high school. Since 2006, the NBA has required that players of any nationality who complete athletic eligibility at a U.S. high school cannot declare themselves eligible for the NBA draft unless they turn 19 no later than December 31 of the year of the draft and are at least one year removed from the graduation of their high school classes. The NBA’s rule not allowing high school players to enter the NBA created the phrase “one-and-dones” after highly rated high school prospects with NBA potential would play one season with a college or university. The debate over whether college athletes should be paid has strong cases on both sides. One of the biggest issues facing college basketball and college football players ability to receive money is their lack of ability to unionize. In 2015, the Northwestern football team attempted to unionize but the National Labor Relations Board rejected the attempt and ruled that stepping into college sports would “not promote labor stability.” The decision meant that the effort to unionize college athletics has very little chance of happening. 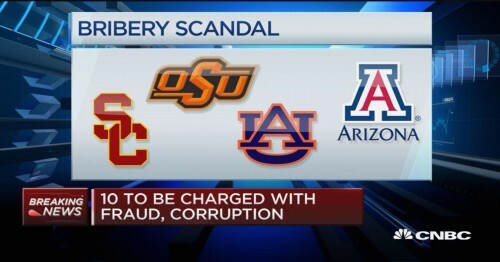 However, the money in underground of recruiting and the dollars generated during March Madness means the topic of paying college athletes has grown new legs as this huge college basketball scandal develops.